The decision to go hiking in Catalonia was one of the best ideas I’ve had. This varied land surprises you with each step you take. Getting to know it by foot is by far the best way. Take it slowly and enjoy breath-taking views. During my two weeks long trekking, I walked along the GR-5 trail most of the time. I was blown away by the nature of Park Montseny and completely in love with Catalan landscape by the time. Nature's diversity of Catalonia surprised me – over the few days of hiking I moved through a variety of rock formations and soil colors. Before I entered the Parc Natural de Sant Llorenç del Munt i l'Obac, I walked from Auiguafreda to Sant Felieu. I must have messed up the trail, as I ended up in campsite Sant Quirze Safaja. It proved to be a happy mistake – the campsite was clean, big and had heating in the bathrooms. It was late February and the days were already pretty warm, especially when you were moving around. But the moment the sun set it was getting cold very fast. Some links in this post may contain affiliate links, meaning if you purchase an item, I receive a small commission at no extra cost to you. Thank you for your support. There was also a restaurant and, armed with my information on gluten-free diet in Spanish, I was happy to eat a famous Catalan dish of French fries and hamburgers ;-). The owners were wonderful and were checking multiple times what I could or couldn't eat. I can't speak Spanish nor Catalan and they spoke no English, but thanks to my google translate apps and their good attitude, I could have a good meal with the side of wi-fi. By that time I was in need of a rest day. I was lucky that the campsite was very close to a bus stop, so I went to Sant Felieu. My plan was to pick up the GR5 trail there again after a day off. To my surprise, there was no hostal in this town and I was advised to go to much bigger Caldes de Montbui. Instead of resting I spent the whole day walking around this charming town enjoying its historic architecture. 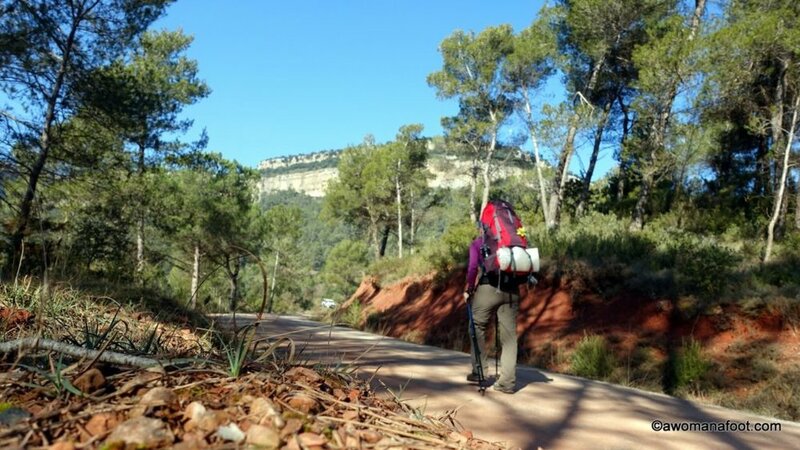 The next day I went back to Sant Felieu to rejoin the GR 5 trail. I must admit that this section of the trail is kind of... blah. It takes you through nice forests, but as it was popular with bikers, the trail was horribly eroded and muddy. Some parts were difficult to go through without risking a muddy bath. I am glad I had my trekking poles with me, as they added stability and support. Because of all that, walking this trail seemed to take forever. Adding to it, soon before entering Sant Llorence Savall, there is another GR trail crossing with my GR 5… with no signage whatsoever. Finally, when I was really annoyed why I still didn’t reach the town, I checked my ViewRanger… I was 3km off! Later I found out it was a new off-shoot from the GR 173 trail, which wasn’t even on the map I had! It was the second time I got confused by the system where all GR trails use the white-and-red markers. It’s accidents waiting to happen. It was not the time or place for an extra 7 km walk. I reached the town on my last legs and found the hostal closed. It was getting dark and cold very fast, so I went online and booked the hostal through booking.com. I then called the place and asked about reservation – the lady could only say “booking” in English. She came from somewhere and opened the hostal for me… then showed me the room and where I can make a coffee in the morning. She then locked the hostal with me inside. So I had the whole thing to myself. The hostal was pretty luxurious (and expensive - €50) and I was glad to have a bath and nice bed. But it was cold and during the night suddenly a weird lamp (emergency?) went on! I couldn’t turn it off, so finally put a buff over my eyes and went to sleep. Really weird. The next day beautiful views hit me almost steps outside the town. I was stunned by the strange rock formations, the landscape looked like from another planet. I was in love right away and surprised how different nature was from Park Montseny – even though it was just a few miles away. Parc Natural de Sant Llorenç del Munt i l'Obac is a protected area around the Sant Llorenç del Munt massif and Sierra del Obac. Its highest peaks reach above 1000 m: Montcau (1052) and Mola (1104 m). Thanks to the climate you will see oaks and pines, with quite a lot of shrubs and bushes, including aromatic thyme and rosemary plants. The most characteristic elements of the landscape are the rocks made of a conglomerate. To my ignorant eyes, they looked like poor quality sidewalk cement – made with big stones and some filler. I’ve never seen rocks like that! You can see a variety of different stones and rocks in those clusters, like quartz, limestone, shales and igneous rocks. That kind of rock is prone to erosion causing the whole area to be very rugged and filled with crags and valleys, filled with monoliths, caves, and canals. I was charmed with the beauty of this area. I could just sit and stare for hours... So much beauty and serenity! During all that hiking I rarely met anyone, I could just walk with no anxiety or worries. While walking along the trail there is no way to miss the signs of wild boar activity. When I was wild camping I could hear them passing right next to my tent! Gave me quite a scare, to be honest. I picked my spot to wild camp with difficulty – it’s hard to find big enough flat spot anywhere. Even though I knew I could wild camp as a through-hiker, I wanted to hide from possible early-morning hikers. When I finally found a somewhat good spot, it was covered with stones and rocks – there is no way to find a soft, grassy spot in Parc Natural de Sant Llorenç del Munt i l'Obac! But I am not complaining at all – the spot was stunningly beautiful and I loved watching the sun setting down over Sant Llorenç del Munt monastery on La Mula. Pure magic! By the way – if you wanted to actually make a hike to Mula, you would need to make a detour off GR 5 at Coll d’Eres. It would be well worth it to see more of the Sant Llorenç del Munt massif, as GR 5 only treks through part of its northern edges. This night was the coldest from all the camping I had – I woke up to frost on my tent. I had a slow and lazy morning, waiting for my sleeping bag and tent to dry well before packing up. I found out that I camped very close to the information center (Centre d'Informacio del Coll d'Estenalles) where I went later to inquire about Mura. This is a great spot to join the trail - there are a big parking lot and a bus stop (buses from Terrassa). There are also bathrooms there but the water is not drinkable (get your water filter!). The lady who worked there had excellent English and was very helpful. Click through to read about my beautiful hike and walking around the medieval Mura here and about El Puig de la Balma where I stayed the night, here. The next day I rejoined the GR 5 trail and soon made another (much smaller) detour. This time I decided to check the trail to a spring (Font de la Pola) as I was already on a lookout for possible wild camping spots. The downside of the marking system in Catalonia is that there is rarely information on distance (in meters or time). It’s hard to figure it out sometimes. I am glad I did this detour. The walk is pleasant and flat but provides beautiful vistas. By the spring there is a picnic table and you have quite the view! For me, it was not a good place for a wild camp, though, unless you are in a tight spot. It was somewhat hidden from elements - in a big but shallow cave but not hidden from passers-by. I decided to cook my hot meal right there so I wouldn’t have to do it later by a wild camp. Would you like to see more of my photos? My wild camp spot was again rugged and covered with stones but I didn’t mind. With a view of sun setting over the Montserrat Massif… could I ask for a better spot? Views like that are the main reason why I love camping. The night was surprisingly warm, which was a sign of the weather changing for the worse. The whole day was gloomy and you could smell the rain in the air. The great Montserrat massif was getting closer and closer, fascinating and awe-inspiring. I left Parc Natural de Sant Llorenç del Munt i l'Obac behind me trekking toward Monistrol de Montserrat, thinking only about climbing the famous mountain the next day. Which I didn’t end up doing thanks to the weather: it was raining and visibility dropped to maybe 20 m…just my luck! You can walk this section of GR 5 coming from Barcelona. You can reach Sant Llorence Savall by bus or a combination of train and bus. Take a lot of water with you - there aren't many streams or rivers. Make sure you are prepared! Take a thicker sleeping mat. There is no way to properly clear the camping spot, so a thin mat isn't enough to provide a night's sleep. The terrain is very rugged and difficult. There are some steep uphill walks but no serious climbing. I advise using trekking poles and wearing sturdy hiking boots. I have seen some trail runners on my way - but I suggest taking it really slowly. I can't count how many times I wanted to just stop and stare - the views are too beautiful to rush by. Some parts of the trail are rough and/or steep. I was doing 10 - 15km/day and I found it just perfect. Grab a pdf map of Parc Natural de Sant Llorenç del Munt i l'Obac from this site. Have you hiked in that area? Would you love to?